Healthy Coconut Milk Eggnog Steamers! 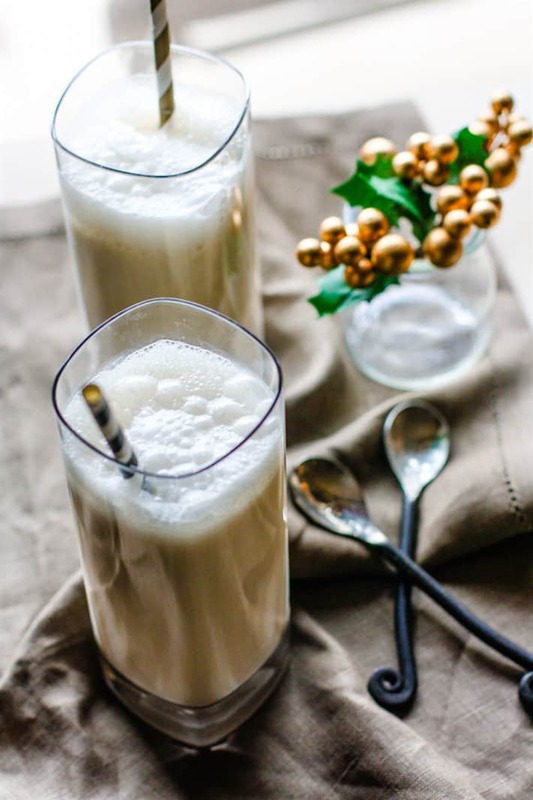 This dairy free eggnog drink is quick to make, single serve or for multiple, full of good healthy fats, and super delicious! Enjoy during the holidays or anytime! 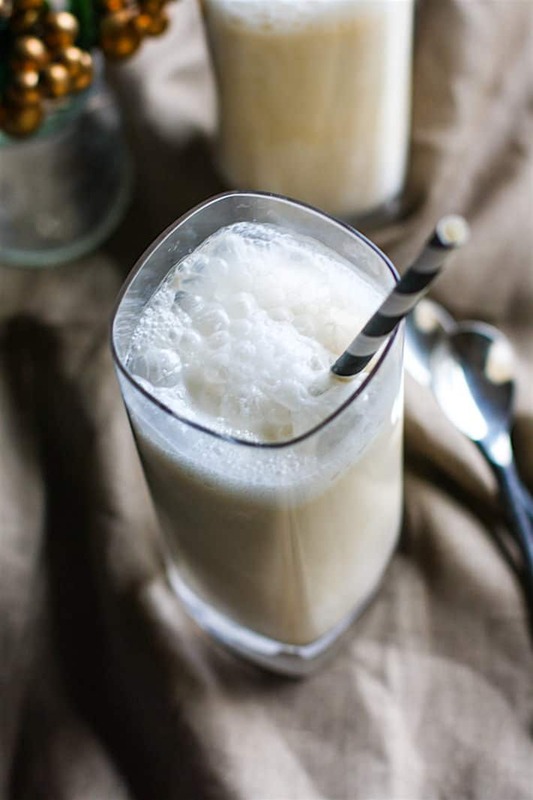 I was going to title this post “WHY EVERYONE NEEDS TO LOVE EGGNOG” or “WHY EGGNOG MAKES A GOOD POST WORKOUT DRINK.” But then I realized it would probably get butchered to death. And I’d probably confuse the heck out of you. Right? But at least it would have grabbed your attention, ha! 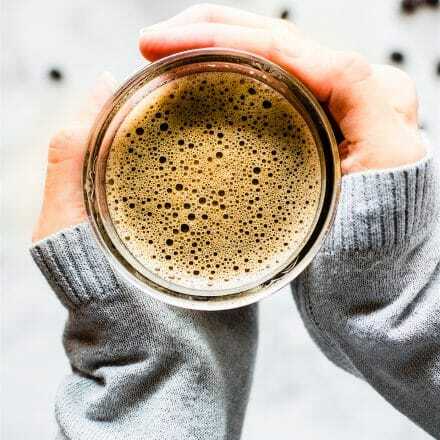 And hey, it’s Friday, so I’m going to save you some brain power and just talk about how to make a healthy happy hour with cozy coconut milk eggnog steamers, sound good? 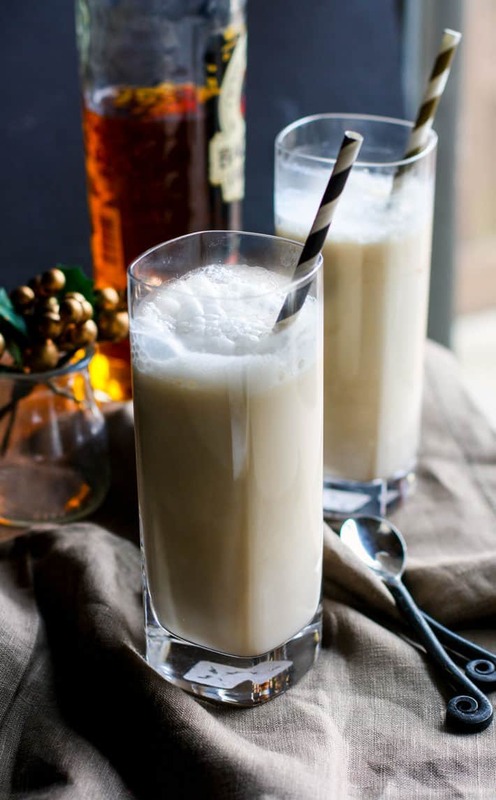 The fact is, Eggnog is a popular (and might I add tasty) holiday beverage! It can definitely be made HEALTHY or HEALTHIER if you choose the right ingredients. Some of the pre-made carton or pasteurized versions can be loaded with added sugar and other preservatives. 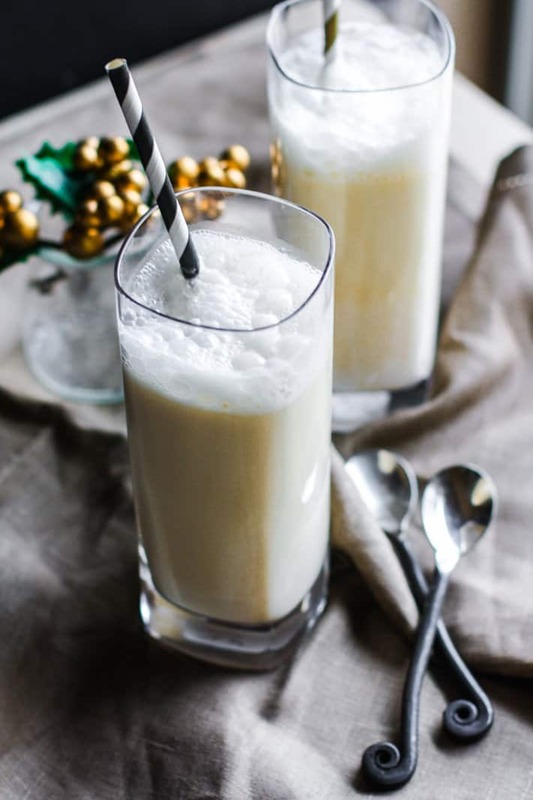 But you see, when you make REAL traditional EGGNOG, the recipe and ingredients itself are actually packed healthy fats, complete protein, anti-inflammatory spices, and even a few medicinal properties if you use rum (or other gluten free alcohol). Hello, you know we are all about the medicinal purposes here ya’ll! Coconut Milk Eggnog Steamers Recipe for Two! You got your Egg yolk and Coconut Milk –-> Healthy Fats! Plus the egg yolk is a great source of biotin and dairy free Vitamin D. Egg Whites for extra protein and froth! Cinnamon and nutmeg for anti-inflammatory properties. And bonus Coconut Cream for B vitamins,which can help your red blood cells turn calories from food into usable energy. Ya, so there’s that reason. Now about this steamer. Ever since I worked at Starbuck (um, decades ago), I was obsessed with making milk steamers. Well, much hasn’t changed. And my goal for these coconut milk steamers were to entice you with a warm, rich, but still light, frothy drink! The fun things about these single serve eggnog steamers is that you can customize it. More or less sugar, vanilla, foam, etc. Plus when you make these single serve, you can omit the alcohol for a kid-friendly version. Although it’s not as fun! Haha. 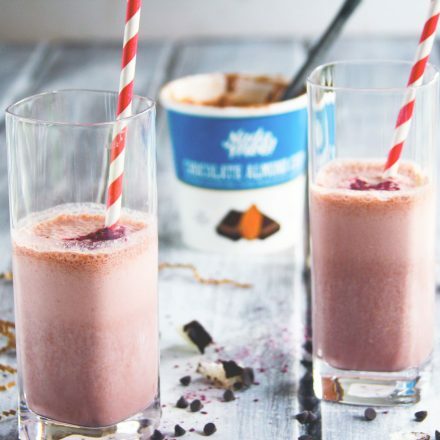 And if you’re looking for an rich indulgent twist, just add dark chocolate shavings over the frothy top. Blend your coconut milk, egg yolk, honey, vanilla, and spices in a blender. Transfer to small pot and whisk on medium for about 10 minutes or until the eggnog starts to thicken. But make sure it doesn’t boil or curdle. In a separate bowl, heat your cream for about 30 seconds. Make sure it’s not too hot, just warm. 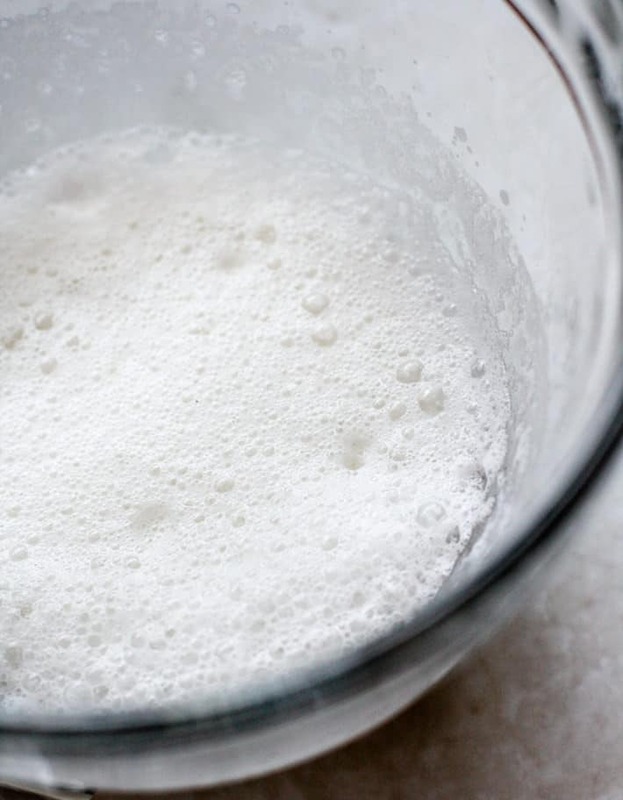 Add your egg whites and sugar to the cream and beat until you get white foaming peaks. Set aside. Take your eggnog mixture and blend it in blender until it a little frothy. 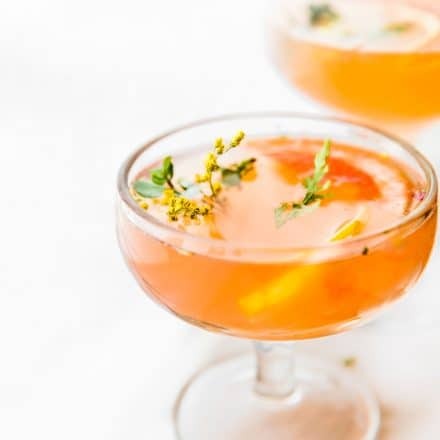 Add 1 cup to each glass along with 1-2 tbsp rum. Top with each glass with coconut cream foam and any extra toppings. You can chill this for later as well if you’d rather have cold with just whipped foam on top. Feel free to use almond milk if you don’t coconut milk. Adjust the honey to your desire. More or less but I found that 1/4 cup worked great for two! Oh and one other reason I made this drink… because my kiwi husband had never had it! They don’t sell much eggnog down under, just hokey pokey milk. Now I have him hooked for life. Cheers to that! And Cheers to the first week of December —> National Eggnog Month! Okay, i need to know. 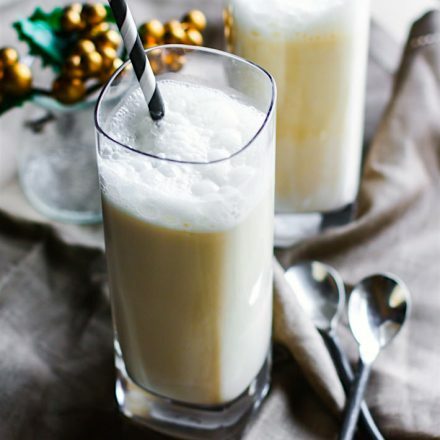 Eggnog –> Yay or nay? My Hubby adores eggnog, although I never touch the stuff because they’re usually laden with crappy ingredients. Not true of this recipe at all, so I can’t wait to give it a whirl and make the Hubby a little happy. he better rub your feet if you do! but seriously, let me know if you try it, hot or cold. I did both. And let me know if it’s sweet enough for him. K? I have never had eggnog in my life so I really have no idea what it tastes like, but this sounds like something I would make for sure! Oh my yum…I need these TONIGHT. My favorite eggnog flavor with a little bit of rum? Sign me up. 🙂 TGIF! Leaving this one to you 😀 Or what if I just made it as nog without the egg? It’s so nice of you to make one for me! hehe. But can I tell you that I’ve never had egggnog? hey katie eggnog! keep me posted on this! This wins heads and tails over store bought ‘nog! 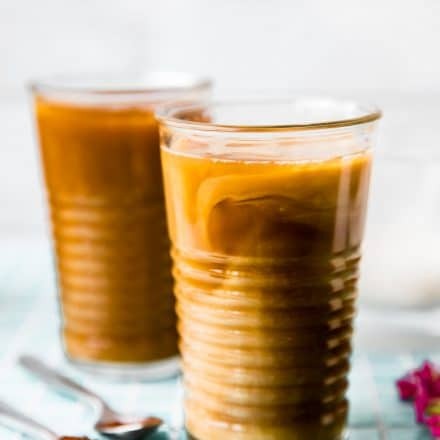 Up until I came to the States, I’d never had eggnog either – actually, I always passed on it t friend’s places and never tried it till my daughter came along and started wanting some! So, I’ve never tried real eggnog because it always grossed me out for some reason. My first experience with non-dairy nog was just a couple weeks ago at Thanksgiving, and while it was SUPER sweet, it was still tasty. I think I’m a fan and I definitely need to try out this recipe! So I am not usually a fan of egg nog (because of the dairy) but I will have to give this a try! So creative! yay, let me know if you do! Can you believe I’ve never had eggnog? I think this should be the year I finally try it. This version actually sounds so so good and healthy too. 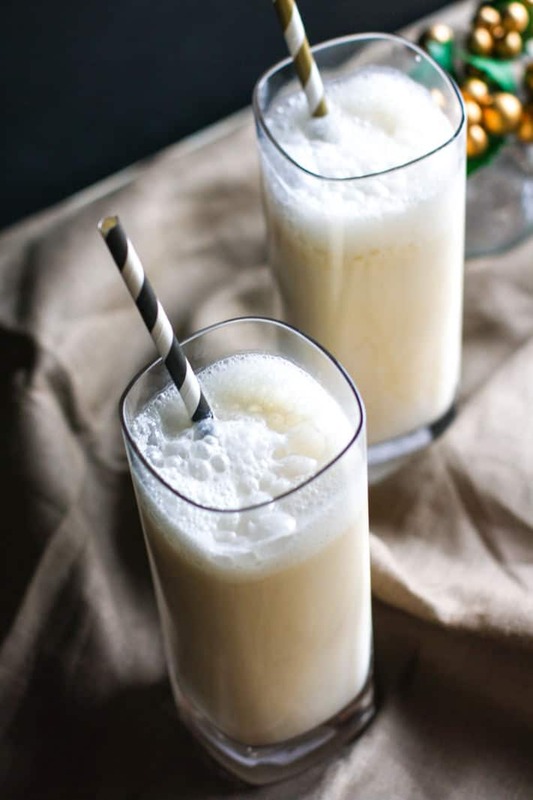 I have been putting coconut milk egg nog into my morning protein shakes to make them festive! I am obsessed! so i kinda think that you could make an EPIC eggnog shake or bar or oatmeal or something. I just know it! Make you magic spoons! i know, that’s why i hate buying it. BOO! but i think you’d love this liz! I absolutely love eggnog and will always indulge in a glass or two every holiday season. 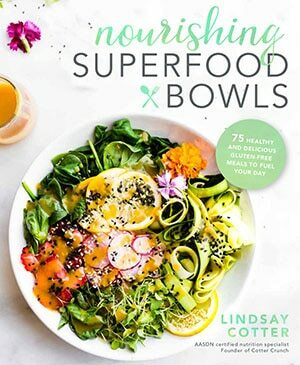 That said–I love this healthified version, especially since you are singing the praises of the much misaligned egg yolk! BTW–I am eating leftovers of your parsnip/carrot mash as we speak! So good. Confession: I can’t stand eggnog. Even with booze. This looks way better than the traditional stuff I can’t choke down though – I like the coconut! I’d probably try anything you made though. This sounds amazing – I used to suffer through steamers with milk, because I loved the flavor – but dairy and I aren’t good friends. THIS I could totally handle!! This sounds incredible! My husband loves eggnog and I enjoy it also, as long as it’s not the weird fake stuff. Making homemade eggnog is on my list this Christmas season! totally! all that stuff just messes it up. I haven’t had homemade eggnog in years, oh the memories! I love eggnog, but hate buying the kind in the stores because of all the added sugar. I love that this uses natural sugars and coconut milk!!! crazy how much they add, right? Oh my goodness these look so delicious! We have been looking for a good eggnog recipe and I think we have just found the one to try!! Yum! Definitely making these, with rum YAY!! 😉 quick question, did you use canned coconut milk? YOu can used canned or I also used the silk coconut milk. THe coconut cream was from the can. Does that make sense? Hi. Your eggnog looks so pretty 🙂 I like it in small quantities – too sweet and creamy if I have too much! YUM! I love eggnog but just can’t bring myself to buy the store-bought kind anymore. However, this recipe looks delicious and I can’t wait to try! 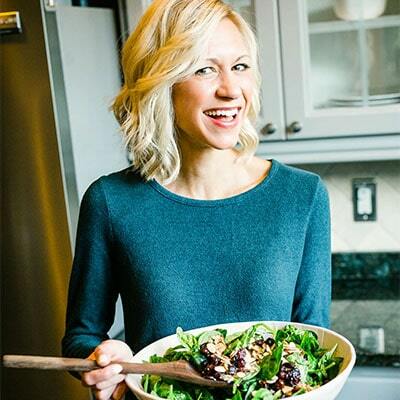 Lindsay, I am so excited to try this recipe! I love eggnog, so this is right up my alley. I’m sure it’s so yummy using coconut milk as the base. Seriously cannot wait to make it. Thanks for sharing! yay! keep me posted and thanks for sharing! Lindsay you’re a genius!!! This is perfect for Christmas parties. Now one question – when you say coconut milk do you mean the stuff you buy in cans (like for curries), OR the stuff by the soy milk? You can do either! I found it easier to use the so delicious or silk coconut milk in the pan and the canned coconut cream for the froth. does that make sense? Delicious might just try the vegan nog version… Using my nespresso frothier and your delicious recipe. Wishing you a super 2016!!! wonderful! i love nespresso! Happy New Year friend!